A while ago it seemed like everyone I knew was going on silent retreats. A friend of mine couldn't stop sharing with me the power of silence to clear the mind and bring clarity of thought. She insisted that I simply must go on one. At that time I was hell bent on the fact that it simply wasn't my thing. "I'm an external processor and need conversation to draw out my thoughts" I would tell her but she kept on persisting and then eventually bought me a spot on an upcoming Silent retreat at a monastery. Even though I really didn't want to go, I now felt that I had no choice. I went and tried to act grateful for her buying me the not-so-cheap ticket. I was appreciative for the gift but not so looking forward to spending 48 hours on my own, in an unfamiliar environment, completely silent with just my own thoughts. I bet you're expecting me to say how much of a covert to the silence I was. Not so. I hated every second of it. My mind was so noisy that the silence only seemed to magnify it and make it louder. I didn't know how to keep still and the 48 hours of mandatory silent meditation was complete and utter hell for me. At that time I simply wasn't equipped to draw out the goodness from the silence. My body at the time was wired with adrenaline and sought out stimulation wherever it went. A silent retreat was a little like a crack addict going cold turkey. My friend was right about one thing, there is lots of scientific research and psychological experiments that point to silence being good for enhancing well being but heres what she missed. Silence has to be consensual. When silence isn't consensual it becomes a form of punishment and torture (think of prisoners in segregation) and thats what those two days became for me, complete torture. I couldn't wait to get out of there. Fast forward a few years and I'm a little more friendly towards the concept of seeking silence. These days I frequently pursue silent moments alone to get back in touch with myself and refuel my energy banks. I find silence deeply healing. When it came to choosing a location for my hen do me and the girls all felt that a bit of silence was exactly what we all needed. Not complete silence, have you ever seen those experiments when someone is put in a sound proofed room? They can't stand to be in there for more than 45mins because the sound of their heart beating and the blood running through their veins becomes so loud that its unbearable to stand it any longer. It wasn't complete silence we were after, just an absence of those overwhelming sounds that drown out the important ones that we really need to hear. We chose to go to the Faroe Islands as it was completely different to anywhere any of us had ever been before and it ticked the silence box. It's also been on my bucket list since 2014 but i'd never found anyone else willing to go with me. As soon as we got off the plane and began walking down the steps towards the run way, two things stuck me. The first was that the air was thick with the dewy petrichor after the morning rain. I'd never experienced this smell of rain fall so intense, it was almost tangible. The second, was the silence. We were on the tarmac of an internaitonal airport and yet the energy around me was so still. I've been to meditation classes that were louder and busier than this airport was. As I looked around and absorbed my new environment I was very aware that we were surrounded by dramatic cliffs lush with bright green grass that almost looked like a photo that had been over saturated. I'd never been anywhere this still. The short 72 hours we were there we spent our days and evenings (the sun didn't set) driving through the winding cliff side roads in thick fog. We'd suddenly enter into a clearing where the fog would dissipate and reveal the most captivating landscape. Some of the sights were mind boggling but the thing that blew me away the most was the silence and stillness of the atmosphere there. If you listened you could hear birds chirping, birds were actually some of the loudest noises I heard whilst there, water flowing and the occasional sheep bleating but other than that, silence. No sirens or music blaring, no people shouting at each other from across the street. Just the natural sounds of the earth slowly breathing. For those of you who are unfamiliar with the concept of seeking out silence heres some of the reasons why I suggest you give it a go. But, before you do, learn from my story at the start. Don't jump in at the deep end and sign up to some ridiculous silent torture retreat in the Himalayas or something like that. Take it slowly by starting to find a silent 5 or 10 mins in your day and develop it from there. Silence allows you to become more focused: Being in an environment where noise and movement are going on all around puts increased demands on our metal capacity in order to process all the stimulation that is coming at us. Our brains processing power is literally being pulled in all directions trying to assess our safety, our needs and navigate our next steps. We only have so much brain power and when it's being pulled in so many directions it means we have little power left to really focus on the things that are beneficial for us to focus on. When these distractions are removed we can hone all this processing power into one place which means we can problem solve quicker and be more productive. Silence gives us time and energy to focus on the things that don't appear to be a priority when you're just trying to survive in a noisy world. Silence facilitates thought: Whenever I'm visioneering (engineering a vision) the process is always started in silence. Without all those subliminal distractions I can become more tuned into my thoughts, opinions, emotions and dreams. I become more creative in silence and find dreaming and cultivating visions much easier when there's less noise around me. Silence gives me time to reflect on what I'm learning in life at this moment in time and apply previous lessons that i've learnt to situations that I'm going through right now. Cultivating moments of silence gives me time to view things in a different way to what i'd normally default to. As I open my mind to alternative perspectives I find my life becomes more fulfilling and rewarding. Silence produces rest: A friend of mine who lived in London lamented to me how she needed a break, a few days later she booked herself on a weekend trip to Rome. She came back even more exhausted than when she left. She escaped London, a noisy busy city, and attempted to find refuge in Rome, another noisy busy city. Her body didn't need another city break, it needed stillness and quiet. Science has proven that bodies who are surrounded by noise remain in a state of stress and release stress hormones on a continuous basis. We don't always realise how mentally and physically exhausting noise can be. The drain that noise puts on our senses leaves us depleted over time and this is when we usually proclaim that were 'in need of a holiday'. It's only when we take a break from the noise that we find new levels of rest that we didnt realise our body and mind really needed. Time in stillness and silence gives the body time to flush the body from all those hormones that are eating into the very fabric of our being. It gives our body time to heal from these harmful energies. Silence is restorative. Wherever you live you can find silence. When I used to live in central London I would go down to the banks of the river Thames at low tide and just focus on the lapping ripples of the water on the mud shores. 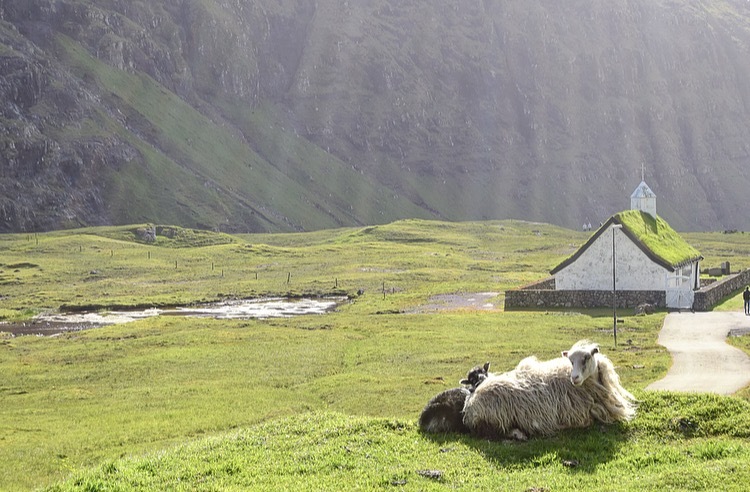 It was a far cry from the silence of the Faroe Island but it was still quiet relative to my situation at the time. These days I tuck myself into a headland somewhere, make a cup of tea and watch the water. In the mornings theres a window in my house which is flooded with sunlight. My coffee there, in silence, looking out at the birds in the garden is pure joy and where I get most of my inspiration for the day ahead. I encourage you to find your own moment of silence in your day whether it be in nature or in the bath tub. Try it and see. 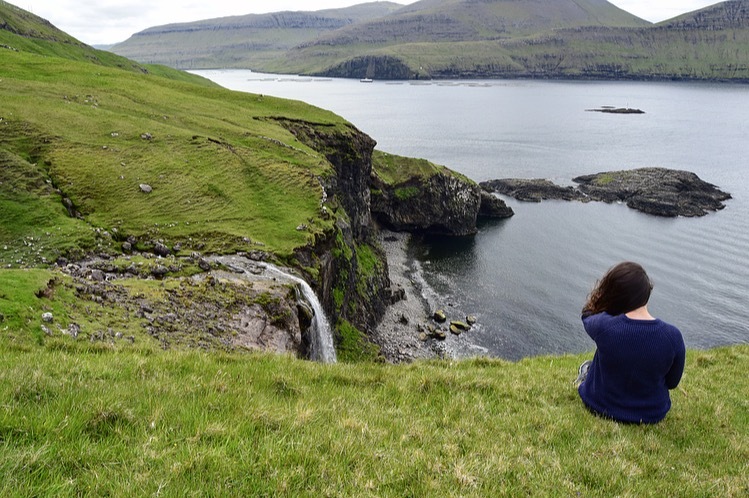 Planning a trip to the Faroe Islands yourself? Here are my top tips. A short trip over here is made easy by regular flights from London Gatwick. However, bare in mind that the weather here is so changeable and extreme that you might not be able to leave the house for two days. Best to tag on an extra couple of days if you can just to make sure you see everything you came to see. Do your research beforehand. Pick your points of interest, mark them on a map, figure out how long it takes to talk to each spot and come up with a plan for your time there. Then be prepared to throw this plan out of the window with the ferry's don't run, the fog is too thick to see anything or the wind is so ferocious that it will blow you off the cliff. Create a plan but be prepared to deviate from it. Deffo deffo deffo hire a sat nav with your hire car. Expensive but priceless. If you're a foodie and hoping to sample some of the local cuisine, book your restaurants in advance. We couldn't get in anywhere on one night and ended up eating at home and another night we very nearly ended up eating at the local Kabab shop. Theres a few good restaurants on the island. Find out who they are and book. Pack layers, thick socks and walking boots. Looking cool won't serve you well out here. There is no cafe culture out here so if you're thinking of a tea and cake after a long hike then forget it. Take a thermos and tuppaware. You can buy nice cakes from the super market. Make the most of the light nights and go do some of the sights when theres no one else around. Book nice accommodation, you may end up stuck in it for a little while if the weather comes in. Also pack a book or download a movie or two on your lap top. As I type this I'm staring at the ocean.